The product range detailed here is not exhaustive, as special one off’s are also produced on request. All products are designed and crafted to suit each customer’s own specification at The Old Forge under the direct supervision of Peter Folan. Peter Folan is the man behind The Old Forge, which, is a long & well established traditional workshop producing superb quality wrought iron crafted products that last a life time. 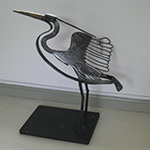 Peter has gained exceptional International experience developing a wonderful range of designs and one off commissions of hand crafted wrought iron products for both indoor and outdoor installations. The Old Forge guarantees that all customers will receive exactly what was ordered, competitively priced & delivered on time. The Old Forge enterprise produces no ordinary wrought iron products, but really top quality designs, carefully crafted, using only the highest quality materials and components that are well engineered ensuring long life & no maintenance. The Old Forge commitment to all its valued customers is that they will receive products of only the highest quality workmanship, craft and reliability that are designed for life. The product range detailed here at The Old Forge are not exhaustive, as special one off’s are also produced based on the customers designs preferences and requirements. 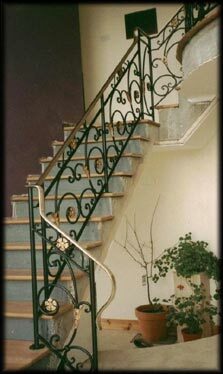 Gates – automated or manual, staircases, both spiral or straight, railings, arch door’s and extensive furniture products.